The Onsight Cube-R industrial wearable brings hands-free collaboration and thermal imaging to the world’s toughest environments. Whether your teams need to see and capture visuals, or share live video and images during remote collaboration sessions, the Onsight Cube wearable provides a secure and safe solution. 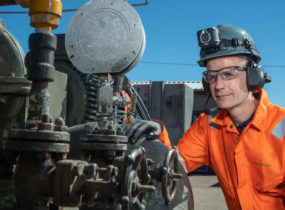 Designed for safe operation in rugged environments, the Onsight Cube-R captures live video, HD pictures, and thermal imaging for effective independent work and remote collaboration. Pair the Cube-R to an Onsight Connect enabled mobile device and immediately control the camera safely from afar. Adjust lighting, zoom, or take pictures and thermal images, to gain access to critical visuals. Workers can also capture and securely store images or recordings on the Cube-R directly and later upload to Onsight Workspace or share in collaboration sessions. With dual cameras inside, choose between optical HD video and pictures, thermal imaging or fusion mode for infrastructure health and trending information. Fusion overlays the optical and thermal cameras for added definition. The integrated light ring and laser aim pointer also ensure high quality visuals even in poorly lit environments. The multi-purpose design of the Cube-R allows for hands-free, handheld, and monopod use to access hard to reach places. The magnetic auto-latch mount provides an easy and secure way to attach the Cube-R to hardhat and headband accessories that were built for rugged environments. Multi-purpose, dual camera wearable with thermal imaging for rugged environments. Mount to a hardhat for secure hands-free use. Magnetic auto-latch mount provides easy attachment. Clips lock the band in place. Headband accessory also available. Attach to a monopod to access hard-to-reach places. Supports a wide range of monopods and other standard tripod mount accessories. Hold the Onsight Cube to perform up-close inspections. The safety lanyard tightens around the wrist for protection from accidental drops. Switch between optical and thermal imaging cameras, or use fusion mode for added details. Capture and share HD video and pictures as well as thermal visuals. HD optics and thermal imaging for complete asset analysis. Rugged design for safe operation in industrial environments. Securely record and store videos, pictures and thermal imaging on the Cube-R. Pair the Cube-R to your smartphone, tablet, or wearable for full remote control. Get a live demonstration of Onsight Cube and the Onsight Augmented Reality Service Platform.